Farewell to Spring is so called because it is one of the last conspicuous native wildflowers to bloom before the onset of summer drought. Often seen in mass populations waving above the already cere grass. Blooms May-July normally, but a little supplemental water and removing spent flowers will continue the show. Otherwise it will die upon setting seed. The 2′ tall stems support multiple pink cup shaped flowers. Most often with a darker pink/red blotch in the center of each petal. These assist in guiding pollinators and this plant is a prime source for all native bees and butterflies. Excellent cut flower that lasts for quite a while in a vase. This is the sources species of all the fancy cultivars that are raised in the cut flower trade. Reseeds happily in open disturbed sites. Locally native in the city of Portland. Excellent plant for wild areas and is often employed on road cuts and freeway embankments in deliberately sown wild flower mixtures. Oregon native plant. Farewell to spring is so called as it is one of the last flowers to bloom before the onset of summer drought. 2′ tall strong stems support cupped pink flowers often with a darker pink to red blotch in the center of each petal- which is extra showy with a back drop of straw colored grass as it is going summer dormant. Found in open, sunny, somewhat dry meadows and fields throughout the Willamette Valley. Blooms appear in late May to July but a light application of water will keep the display going. Otherwise you can let it go to seed. A prolific reseeder in the right conditions. Often planted in wildflower mixes along streets/freeways. Excellent, excellent cut flower. 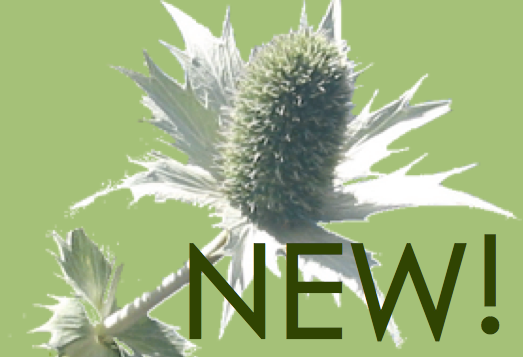 A very important pollinator plant for native bees as well as most pollinators. This is the straight species (subspecies) that is found locally. The seed is from a Willamette Valley source. Very easy to grow. Locally native in the city of Portland. Oregon native plant. Mountain garland is a hardy annual native to the mountains of southern Oregon south into the Sierra Nevada in California. 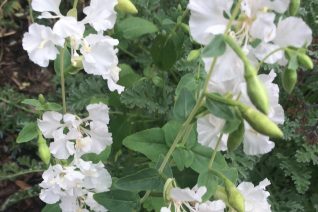 Sparkling white crape-like flowers line tall upright stems on this plant that can be small in poor soil and soar in rich conditions. Size can be difficult to determine based on this…an average of 1′ tall is probably safe. Blooms continuously from May to as late as August if supplemental light water is supplied. 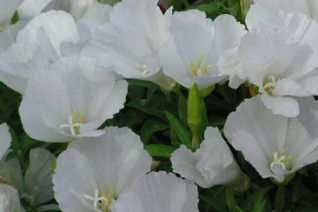 Excellent among perennials such as Penstemons, Erodiums, Salvias, Cupheas. Sets copious seed for the following season and these will be white as well. Leave open disturbed sites in your garden to supply next years crop. Excellent cut flower as well and loved by Butterflies. Very easy to grow. Farewell-to-spring is a common wildflower of meadows and glens in Western Oregon. It gets its name because it is often the last wildflower to bloom before the summer drought ends the show. 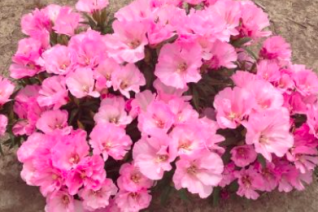 This form differs by its pure pink profuse flowers on a dwarf plant. 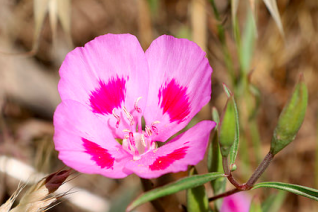 (The wild form is lavender with a red blotch in the center of each petal.). An amazing display of bloom that appears as if someone dropped a bouquet on the ground. You see no evidence of leaves when its in full fettle. Blooms June to October in a garden setting with regular summer water and rich soil and the gardeners diligence removing spent flowers. Reseeds in open disturbed soil. to 10″ tall and a little wider forming a dome. Nice cut flower. Fun variation on a native. Very attractive to native pollinators. True hardy annual. Oregon native plant.